They write: “Green Valley Organics lactose-free yogurts, kefirs, sour cream, cream cheese and butter were created so people with lactose intolerance can bring real dairy back into their lives, enjoying its health benefits and great taste without digestive troubles. 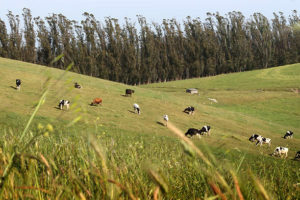 Created by Redwood Hill Farm & Creamery, a 45-year-old company with a strong commitment to digestive health, which is operated by Founder Jennifer Bice to this day, Green Valley Organics is a brand consumers can trust. As of early 2017, Emmi Roth owns Redwood Hill Farm (and therefore, the Green Valley Organics brand). Ownership structure 80 Family-operated business with cooperative milk supply and close ties/partnership with farmers. Milk Supply 75 Own patrons from small local family farms with some cream purchased on the open market. Hormone Usage 50 Therapeutic hormones may occasionally be used during reproduction (oxytocin). Farm Support 90 Brand representatives visit farms at least twice a year.